The Bather by Rodin, Rodin's bather, the bather, Rodin, auguste rodin, Toilette de Venus. 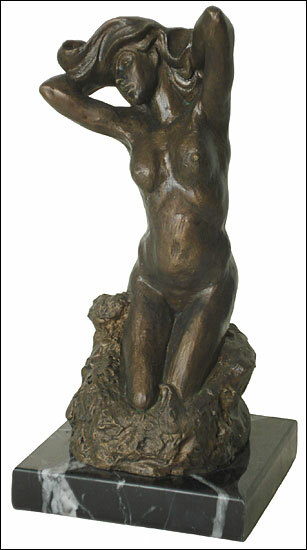 As an artist who adored women, because he adored nature, Rodin turned to women as his main subject of observation. He never started from predetermined subjects but chose, depending on the young women who posed for him, the postures likely to give the body the most expression. I do not create, he said, I see and it is because I see that I am capable of making. This is why he did not burden himself with heads or feet or hands. And although during the first part of his career, he was obliged to earn his living by producing sensual figures, which often echoed 18th century art, to please his art patrons, after about 1895 he gradually eliminated all that he considered to be trivial or useless. The study of sculpture taught him that the more a form is condensed the more it acquires power. Life is in the contours, the soul of the sculpture is in the piece. This is a reproduction of a bronze sculpture made in 1885, based on the kneeling Faun in the Tympanum from The Gates Of Hell, a decorative door for the future Museum of Decorative Arts (Musee des Beaux Arts), to be decorated with sculptures inspired by The Divine Comedy of Dante.